As Seen On "The Today Show"
Until very recently, impact sensors - accelerometers measuring the forces which, when transmitted to the brain, cause sports-related concussions - were only used by scientists in conducting research. The last several years, however, have seen a growing number of companies introduce to the consumer market the first generation of impact sensors intended for real time monitoring of impacts to the heads of athletes in actual games and practices. As is often the case with new technology-based products, the sensors in initial use at some colleges, and by a small but growing number of high schools (and youth programs) around the country - including the football program at Newcastle High School in Oklahoma featured in MomsTEAM's PBS documentary, The Smartest Team: Making High School Football Safer  and in pilot programs for our new SmartTeam youth sports safety initiative  - are still relatively expensive, and they are just now being tested extensively under real-world conditions. Since I began writing five years ago about the use of impact sensors as a technological "end-run around"  the problem of chronic underreporting  of concussions - and especially since The Smartest Team began being broadcast widely on PBS stations around the country - I have been getting a lot of questions about them. Fortunately, as result of my first-hand experience, working closely the past four football seasons (on many football fields) with six different sensor manufacturers, the high school football program in Newcastle, and, most recently, the youth football program in Grand Prairie, TX , and from covering the concussion beat, along with a team of experts and staff journalists, for the past fifteen years, I believe MomsTEAM and I are in a unique position to explain just what impact sensors are all about. Question: What are head impact sensors? Answer: Impact sensors are small, highly sophisticated electronic devices designed to measure and, in many cases, record in real time the number and force of impacts athletes sustain during games or practices. 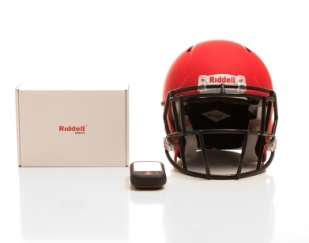 Most sensor systems send impact data wirelessly via Blue Tooth connection to a dedicated monitor, iPhone, iPad or laptop on the sports sideline. In some products, the sensor triggers an audible or visual alarm to alert sideline personnel to a high impact hit, and display the number of hits over a certain threshhold on the device itself. Question: What are impact sensors designed to do? Answer: While impact sensors take a number of different forms (ie. installed inside or on the outside of a player's helmet, embedded in a mouth guard, helmet chin strap, skull cap, head band, or skin patch worn behind the ear, for instance), all are essentially designed to do the same thing: alert coaches, athletic trainers, team doctors, other sideline personnel and/or parents about high-risk single and multiple head impacts in order to improve the rate at which concussions are identified. Some also record data on impacts to a player that day, that week, that season, and over the course of their career. Question: Why is identification of concussion so important? Answer: Early identification is critical because if sideline personnel suspect that an athlete has sustained a concussion or an even more serious brain injury, they can immediately remove the athlete from the game, eliminating the risk of further injury. If an athlete suspected of having suffered a concussion is quickly removed from a game or practice and not allowed to return that day, and, if diagnosed by a qualified health care professional with concussion, is not allowed to return to practice and game action until after completing the symptom-limited, exercise program experts recommend , and being cleared by a health care professional with concussion expertise, most will recover without incident fairly quickly. If, however, a concussion or even more serious brain injury goes undetected and an athlete is allowed to continue playing, studies suggest that recovery from concussion, when the concussion is ultimately detected and diagnosed, is likely to take longer. In addition, delayed identification increases the risk of long-term problems such as early dementia, depression, more rapid aging of the brain , or of the devastating degenerative neurological condition known as chronic traumatic encephalopathy or CTE  (although medical science has not come close to quantifying that risk). In extremely rare instances, a player who continues to play with concussion symptoms can suffer catastrophic injury or death from second impact syndrome , a form of swelling of the brain . It is thus critically important that athletes with concussion be identified and removed from play as quickly as possible. Question: Don't athletes know when they have suffered concussions and routinely remove themselves from the game so they can be checked out by medical staff? Answer: Unfortunately, no. Studies published over the past ten years have consistently found that concussions are significantly under-reported by athletes, with at least half, and perhaps many more, going unreported. One 2013 study, for instance, found that high school athletes only reported 1 in 7 impacts they classified as "dings" or "bell-ringers," many of which are likely concussions. Question: Why don't athletes report experiencing concussion symptoms? Answer: For a number of reasons. Some athletes don't report because they don't know what the symptoms are, or because the concussions they have suffered adversely affect their judgment and cognition, so, even if they do know the symptoms, they don't recognize that they are experiencing them. Unfortunately, most don't report because a deeply engrained culture in contact of contact and collision sports (dubbed by one recent study as the "culture of resistance" ) tells them not to; they don't report because they don't want to disappoint teammates, coaches, and parents by removing themselves from the game; or they fear losing playing time or their starting position. The laws  of every state now mandate - at least at the high school level  - that athletes with suspected concussion not only be removed from the game or practice in which they are participating, but be barred from returning to play that same day, and obtain written authorization to return to play from a health care professional with expertise in the identification, diagnosis, and management of concussion. The laws, some experts fear, make athletes even less willing to report experiencing concussion symptoms because they know that, if they do, they will be benched (and, indeed, there is some evidence in studies that suggests just that). Question: Why, then, isn't the answer to the chronic under-reporting of concussions to educate athletes about the symptoms of concussion and the dangers of continuing to play with such symptoms? Isn't that the law  now in almost all states? Answer: Yes, it is true that 48 of 50 states have passed laws requiring that athletes and their parents sign forms acknowledging receipt of information about concussion signs and symptoms  and the dangers of continuing to play with concussion. Unfortunately, however, recent studies suggest that education of athletes about the symptoms of concussion and the dangers of continuing to play with such symptoms has not resulted in increased reporting, with athletes continuing to resist honestly self-reporting that they are experiencing symptoms or voluntarily removing themselves from game action. Some of the same studies suggest that athletes may be more likely to self-report if they feel safe  in self-reporting, in other words, when they don't fear adverse repercussions if they report in terms of decreased playing time, losing their starting positions, or being embarrassed by the coach in front of their teammates for their lack of toughness, such as, for example, by being labeled a "wimp" (or worse). This has led an increasing number of experts to recommend that concussion education should be as much about removing the stigma associated with reporting, changing the attitudes of players, coaches, and parents towards reporting, and creating an environment in which players feel safe about reporting symptoms, as it is about educating them about concussion signs and symptoms  and the dangers of continuing to play with symptoms. The problem is that no such programs yet exist (although this is going to be a key objective of our SmartTeams program, and our pilot program for the NCAA and Department of Defense under our Mind Matters Challenge grant ), and even if were implemented on a widespread basis (which, once again, I hope will happen once we launch the full SmartTeams program in 2016), it is unclear whether such a shift in emphasis in concussion education will achieve any meaningful increase in rates of self-reporting, at least in the short term. The reason, again, is that it would not only require a paradigm shift in the "warrior" culture  of contact and collision sports, but a fundamental change in a risk-taking attitude which is in virtually every adolescent's DNA. Question: So if athletes won't report concussion symptoms, why can't we just rely on sideline personnel to watch for signs of concussion in athletes so they can be removed from play? Answer: Relying on the observational skills of sideline personnel is not enough for a number of reasons. To begin w ith, the signs of concussion are often either subtle or non-existent, so they escape detection by sideline personnel. Gone are the days when it took a player's loss of consciousness  or heading to the wrong sideline or end zone to raise a red flag about possible concussion. Many escape detection by even well-trained sideline personnel. One Canadian study, for instance, found that physician observers in the stands identified concussed athletes at a rate seven times that of coaches and athletic trainers on the bench. Add in the possibility that sideline personnel responsible for monitoring athletes for signs of concussion, such as team doctors and athletic trainers, or coaches and parent volunteers, may be away from the sideline attending to other injured athletes when a player sustains a high force blow, or, even if they are watching the field/court/rink, may miss significant impacts because they occur away from the play, and one can see why better concussion detection methods are needed. (And this assumes that there are personnel on the sideline trained in the identification of concussions. The most recent statistics from the National Athletic Training Association suggest that almost 4 out of 10 U.S. high schools still do not have access to an athletic trainer (although this statistic may be somewhat misleading, as the percentage of high school students with AT coverage is higher, perhaps as high as 70%, due to the fact that larger high schools in more densely populated states are much more likely to have one or mor athletic trainers on staff), and the likelihood that trained personnel will be present during games or practices at the youth level is low). Question: So is this where impact sensors are useful: because they may help improve early identification of concussed athletes? Answer: Exactly. Impact sensors don't depend solely on athletes to remove themselves from games or practices by reporting concussion symptoms, or on game officials or sideline personnel to observe signs of concussion. By monitoring head impact exposure in real time, sensors give sideline personnel an additional tool to alert them to high-risk impacts so they can consider performing a concussion assessment, or, alerted to the fact that an athlete has sustained a heavy hit, can watch them more closely for concussion signs. In a very real sense, sensors are another set of "eyes" watching for concussed athletes. Question: How can an athletic trainer on the sideline keep his or her eyes on athletes on the field to watch for signs of concussion if the AT has to be constantly monitoring the data coming from the sensors? Wouldn't it be better, as some suggest, to have more people on the sidelines observing the athletes? Answer: It is true, as I have learned from my own experience working with sensor companies and football programs the last four years, that a sensor program requires a considerable time committment. In the case of the Newcastle High School football program that we featured in The Smartest Team, the athletic trainer had a student assistent monitor the data coming in from the sensors in players' helmets so that he could continue to keep his eyes on the field. Question: I have heard that impact sensors diagnose concussions. Is that true? Because impact sensors are not diagnostic, a team equipping its players with sensors must be careful not to rely on the data transmitted by the sensors, or the triggering of an alert or alarm, as in any way determinative of whether an athlete has or has not suffered a concussion. Nor are they designed to make any type of recommendation about the ability of a player to play or not play. As Danny Crossman, former CEO of Impakt Protective, the Canadian company that manufactured the Shockbox sensors featured in the The Smartest Team (since acquired by another sensor company, i1 Biometrics) notes, "The main point of the helmet sensors [i]sn't to say, 'You got a concussion.' The point [i]s to say, 'That head took a hit. ...[The athletic trainer] can then use his training, intuition, and his eyes, number one tool is his eyes, to say ‘what just happened there?'" Question: Then, if the mantra in concussion management is "When in doubt, sit them out," and the laws of almost every state require that all athletes suspected of having suffered concussions not only be removed from the game or practice in which they are participating, but be barred from returning until a health care professional with concussion expertise has given them written approval to do so, why can't a program that employs impact sensors simply dispense with the need for a sideline "remove from play" concussion screening? In other words, if the sensor goes off, isn't that enough of a reason to suspect that the player has suffered a concussion so as to bar further participation? Answer: First of all, impact sensors are not intended to replace sideline observers, game officials, coaches, and teammates. They still need to be present and ever-vigilant in watching for signs of concussion  or heavy hits that could cause concussion. If they have any reason to suspect a concussion (whether because they see an athlete exhibiting concussion signs or because he or she took a high impact hit), then they need to conduct a sideline screening for concussion using one or more of a battery of assessment tools (eg. Standardized Assessment of Concussion or "SAC" , Sport Concussion Assessment Tool Version 3 or "SCAT3" , the Balance Error Scoring System or "BESS" , King-Devick Test " , Maddocks" questions ) already shown by studies to be reliable in making the initial remove-from-play decision, or one of a number of new assessment screens being developed and tested. The critical point to always keep in mind about impact sensors is that they are just another tool in the concussion toolbox or, put another way, another set of eyes, with which to identify athletes who (a) may have sustained impacts of sufficient magnitude that (b) may have resulted in some cases in concussions, so that they (c) may be monitored for signs of concussion, or (d) may be asked to undergo a balance, vision, and/or neurocognitive screen/assessment on the sideline or in the locker room, the results of which (e) may suggest a removal from play for the remainder of the game and referral to a concussion specialist for formal evaluation away from the sports sideline, which evaluation (f) may result in a clinical diagnosis of concussion. I tend to agree with those who suggest that, if a program's resources are scarce (which they almost always are), it is probably better to hire another athletic trainer to have an extra set of eyes watching the players. Programs which do not have an athletic trainer should definitely put their money towards hiring one before they consider starting a head impact monitoring program. Question: Isn't this all marketing hype from the manufacturers of impact sensors? What do independent experts in the identification and management of sports-related have to say about the use of impact sensors in the way you describe? Do they see benefits? Sideline personnel responsible for keeping players safe will benefit from objective data that might inform their medical decisions. Experts say that identification of a potentially injurious impact or series of impacts via real-time monitoring of head impact exposure in athletes may not only facilitate the early recognition and management of brain injury in contact and collision sports, but permit early intervention, potentially in advance of an injury, rather than simply as a management tool post-injury. Sensors give them the ability to monitor impacts during the course of an athletic event for the purpose of screening for potential injury. Although an accelerometer system (technical jargon for impact sensors) is not itself able to accurately diagnose injury, it may have utility as a screening device by alerting sideline personnel of an impact that has occurred above a predetermined magnitude or one set for an individual player, thus triggering either observation or a sideline concussion assessment of an athlete. Doctors and researchers will benefit from real-time monitoring because it will allow for accurately cataloging the number of hits and post-impact head acceleration being experienced by an athlete over time. With millions of data points, the scientific community may eventually be able to establish a so-called "hit count" above which there is an unacceptably high risk that the athlete, by continuing to play, may suffer permanent brain damage due to the cumulative effect of repetitive subconcussive impacts, up to and including the remote, but nevertheless real, possibility of developing a neurodegenerative disease such as chronic traumatic encephalopathy or CTE . It is important to note, however, that, as one prominent concussion researcher noted in a 2013 study in the prestigious American Journal of Sports Medicine, the concept of a hit count "is fairly new and, as yet does not have published data to suggest that any particular level or number of hits has significant clinical meaning for any particular sport or position. Nonetheless, individual athletes may feel there is a benefit to having an estimate of forces their brain experiences over time." Likewise, the 2014 IOM/NRC report  on youth sports concussions, while noting that "the concept of limiting the number of head impacts is fundamentally sound," found that implementing a specific threshold for the number of impacts or the magnitude of impacts per week or per season was "without scientific basis." Question: Are there any other practical uses for sensors? Answer: Yes, a number of top concussion researchers also believe that real-time monitoring of impacts could help reduce the total amount of brain trauma from repeated subconcussive blows  by identifying athletes sustaining a large number of such hits due to improper blocking or tackling technique. In an article on SI.com , Kevin Guskiewicz, PhD, ATC., Kenan Distinguished Professor and Director of the Matthew Gfeller Sport-Related Traumatic Brain Injury Research Center at The University of North Carolina at Chapel Hill, said sensors are helping coaches and other personnel at UNC identify athletes who are sustaining a high number of high force impacts, especially to the top front of their helmets which appear to be the most worrisome from a brain trauma standpoint, as a result of poor tackling or blocking technique. "If a player is observed repeatedly sustaining larger impacts to the crown of his head," he told SI, "coaches will work with him on adjusting his technique." Using impact sensors as a teaching tool isn't just happening at the college level. It is happening in high school football, too. After Purdue researchers  found that high school football linemen who sustained a high number of high impact sub-concussive hits over the course of a season were the ones suffering impairment of their visual memory, the information led at least one player to change his blocking technique. As Tom Talavage, the lead author of the Purdue study, told PBS's Frontline in a 2011 interview , he estimated that at least 50 percent of the high impact hits linemen and linebackers were sustaining were due to poor technique. "Some of the players that we have on our team have not very good technique, to be quite honest. And what you'll find is, they will launch into a play, and they will lead with their helmet. Other players will more correctly keep their head up, try to get their arms up as a blocking technique, or when they're rushing, they will try to get their arms up as a means to push the offensive lineman out of the way. Those technique differences lead to a very large difference in the total number of blows experienced and where those blows are experienced on the head." Talavage said that when one of the offensive lineman who was found to have suffered cognitive impairment after sustaining a high number of subconcussive blows (impairment that persisted beyond the season) decided to change his technique, he experienced a drastic reduction in the number of blows to the top front of his head and a moderate reduction in the total number of blows. The result was that, after the second season, "his neurocognitive testing never detected any deficits, and from a [brain] imaging perspective we saw substantially less change in his fMRI activity. There's still some, because he's still getting hit, but his technique changed the distribution." Research suggests that the cumulative effect of repetitive head impacts (RHI) increases the risk of long-term neurodegenerative diseases such as CTE , Parkinson's Disease (PD), Alzheimer's , Mild Cognitive Impairment (MCI) and ALS (e.g. Lou Gehrig's Disease). While researchers continue to look for the twin concussion "holy grails" in the form of specific impact thresholds above which concussions are highly likely and/or the number of impacts or the magnitude of impacts per week, per season, or over the course of a career which substantially increase the risk of long term brain injury, impact sensor technology is available right now to help reduce total brain trauma by using impact data to identify kids who need more coaching so they can learn how to tackle and block without using their helmets. Question: Aren't there those in the concussion community who do not see impact sensors as currently having any practical utility beyond their use in research? Answer: Absolutely. As with any emerging technology, there will be early adopters and late adopters. Not surprisingly, some concussion scientists and researchers take a more cautious approach to the use of impact sensors than others. Despite finding that underreporting continues to be what she wrote in two 2013 studies to be an "alarming" and "overwhelming" problem, Dr. Johna Register-Mihalik, a research scientist and member of the faculty at the Matthew Gfeller Sport-Related TBI Research Center at the University of North Carolina at Chapel Hill, recently told MomsTEAM that the reason she and her colleagues did not recommend the use of impact sensors in addressing the problem was that she viewed "the use of impact sensors in concussion detection, as the science, although a growing field of information, [as] just not quite there in [terms of] how the[y] may best be used from a clinical standpoint and across all sport settings." Register-Mihalik recognized that "there is certainly potential for this type of technology to have great implications in the identification of concussion as the science advances," but, she argued, "we need more scientific and unbiased evidence of their ability to detect concussion before they are widely used and recommended in all settings. Until that time, there are some good examples of identification techniques of having trained observers, a parent advocate and continuing to promote concussion education that we know will increase identification rates." In an October 2015 Sports Illustrated article , a number of experts said that, while impact sensors showed enormous potential for research, and as a second set of eyes, and believed such promise would grow as the technology improved, they were skeptical about their current value, especially because of their cost, and vulnerability to false alarms. "I would rather see all those high schools go out and even if they shared an athletic trainer, I'd rather see that than see them all go out and spend money on sensors," Dawn Comstock, a leading concussion researcher, professor at University of Colorado's School of Public Health, and member of MomsTEAM Institute's Board of Advisors, told SI. Question: Doesn't the fact that the National Football League recently suspended a pilot program using impact sensors in players' helmets for the 2015 season on the ground that the data it had collected during the 2013 season wasn't considered reliable suggest that impact sensors aren't ready for use outside the research realm at any level of football? Answer: It is true that the N.F.L,, as first reported by Sports Business Journal  and, later that same day, by The New York Times , decided to suspend a pilot program using sensors in players' helmets for the 2015 season because data collected during the 2013 season was not considered reliable enough (for what, they didn't say), and because the N.F.L. Players Association questioned whether the data would be kept private and not used against a player. Duma speculated that one reason the N.F.L. and the players' union might be ambivalent about the use of sensors was because they could show that players were receiving more blows to the head than was commonly thought. He feared that the decision could dampen research efforts by others and didn't acknowledge "all the good things" that sensors do." Interestingly, just days before the NFL's decision to suspend the use of impact sensors was announced, my local paper, The Boston Globe, came out with a powerful editorial in which it urged college, high school, and recreational leagues in contact and collision sports to consider mandating use of impact sensors, or, at the very least, experimenting with the technology, to alert the sideline personnel to hits that might cause concussion, and to track data on repetitive head impacts, which, a growing body of peer-reviewed evidence suggests, may result, over time, in just as much, if not more, damage to an athlete's brain, as a single concussive blow, and may even predispose an athlete to concussion. The Globe editorial viewed as "shortsighted" the reluctance of players and coaches to adopt the use of impact sensor technology out of fear that sensors, if they triggered an alert, might result in a player's removal from the game (that, after all, is the whole point) or the player being labeled a wimp (what the Institute of Medicine has labeled the "culture of resistance" ), and it called on professional leagues, like the NFL, to follow suit, suggesting that star players, by using the devices, could help break down barriers to their more widespread use. Question: Isn't another reason against the use of impact sensors that, if they don't trigger an alarm or alert, sideline personnel may be lulled into thinking that the athlete has not suffered a concussion, and thus can safely continue playing? Answer: Yes, such a potential concern has been expressed by some concussion experts. They worry that sensors may identify individuals who receive a certain type of hit or impact, but that impacts not above the threshold may nevertheless lead to concussion, providing a false sense of security, in that "if the sensor didn't go off, I must not have a concussion." The problems of false negatives (i.e. the sensor alert not going off when the athlete is later found to have suffered a concussion), and false positives (i.e. the sensor triggering an alert when the athlete is later found not to have suffered a concussion) are real concerns. Their effect can be minimized, however, if sideline personnel remember to always keep in mind that the sensors are not diagnostic and simply provide additional information for use by sideline personnel in identifying athletes for sideline screening and/or close observation. Question: Are there controlled studies showing that impact sensors significantly improve concussion identification, and, if there aren't, shouldn't we wait to start using them until there are? Answer: It is true that there are, as of yet, no well-designed prospective, randomized, blinded studies showing that teams that equip players with impact sensors help sideline personnel do a better job of identifying concussed athletes than teams that rely on self-reporting by athletes and the observational skills of sideline personnel and game officials. Newcastle's certified athletic trainer, Damon Glass, told me that the sensors were "the next best thing to being inside the [players'] brain basically and seeing the hit, because if I don't know whether it happens, there's lots of times I've been away from the play and never saw it, and I don't know if they've taken a hit or not. So it's gonna be the best thing for me to have a tool, you know, to assess them if they do take a big hit." One of the Newcastle players, Colin Black, admitted to me that, "A lot of the guys, they don't want to come out when they get a concussion, and they know they have one, so the sensors, they don't really give them an option. When that sensor goes off, you got hit hard and the coaches are gonna pull you out no matter what. You can't hide it from them." Another, Sheldon Dillman, said, "Previously, if you got hit and you were just pumped with adrenaline, you might not even feel it until the next quarter. So now at least, you know, if you get hit and the athletic director gets an alert, then they know, hey you need to take a break. That'll do a big part [to improve safety] in football." And a third Newcastle Racer, Chase Prudhome, told me he was glad that the sensors were being used: "It's helped a lot of kids out. We've actually had two of the kids come out of the game with their helmets going off, and they really did have a bad concussion. When the sensors went off, we have a girl that's always on the iPad waiting for the sensors to go off, and she goes over to our trainer, wh[o] goes to the coaches and they get them off the field as quickly as possible." Many of the players, in a private conversations, told me quite frankly, that "we do not want to have the responsibility of reporting our concussions any longer. We want the sensors." I am not a scientist, nor a biomechanical engineer. As such, I recognize and appreciate that there are some in the concussion community, especially scientists - who by their very nature are appropriately cautious in endorsing any new technology without validation via rigorous, peer-reviewed testing - and some helmet manufacturers who believe that impact sensor technology has not advanced sufficiently to warrant widespread use in contact and collision sports. Again, it appears that their objections rest largely on the assumption that they are going to be used to diagnose concussions, which is not their intended use. My experience with the Newcastle football team in Oklahoma leads me to believe that, as long as impact sensors are strictly used for the limited purpose of providing real-time impact data to qualified sideline personnel, not to diagnose concussions, not as the sole determining factor in making remove-from-play decisions, and not to replace the necessity for observers on the sports sideline trained in recognizing the signs of concussion and in conducting a sideline screening for concussion using one or more sideline assessment tests for concussion (e.g. SCAT3, balance, King-Devick, Maddocks questions, SAC)(preferably by a certified athletic trainer and/or team physician), and long as data on the number, force, and direction of impacts is only made available for use by coaches and athletic trainers in a position to use such information to adjust an athlete's blocking or tackling tec hnique (and not for indiscriminate use by those, such as parents, who are not in a position to make intelligent use of the data), they represent a valuable addition to a program's concussion toolbox and as a tool to minimize repetitive head impacts. Question: I have heard that installing an after-market third-party sensor inside a football helmet, or on the exterior of such helmet, will void the NOCSAE certification and/or the manufacturer's warranty. Is that true? Answer: That's a hard question to answer yes or no. The short answer is that whether an after-market impact sensor manufactured by a third-party voids the NOCSAE warranty will depend on (a) whether it is affixed to the inside or outside of a helmet (some are, some are not); (b) whether the helmet manufacturer has decided that the impact sensor voids the NOCSAE certification; and (c) whether the impact sensor manufacturer has made their own certification of compliance with the NOCSAE standard on a helmet model. The long answer is that, it is true that the National Operating Committee on Standards for Athletic Equipment (NOCSAE) initially decided  in July 2013 that modification of helmets with third-party after-market add-ons, such as impact sensors installed inside a helmet or to its exterior, would be viewed as voiding the helmet manufacturer's certification, and that the certification could only be regained if the helmet was retested by the manufacturer with the add-on, NOCSAE later issued a press release clarifying that position : Instead of automatically voiding the certification, NOCSAE decided it would leave it up to helmet manufacturers to decide whether a particular third-party add-on affixed to the helmet, such as a impact sensor, voided its certification of compliance with NOCSAE's standard, and now allows companies which make add-on products for football helmets to make their own certification of compliance with the NOCSAE standards on a helmet model, as long as the certification is done according to NOCSAE standards, and as long as the manufacturer assumes responsibility (in other words, potential legal liability) for the helmet/add-on combination. An additional complicating factor for high school football programs is the question of whether a football helmet to which an impact sensor has been affixed violates the rules of the National Federation of State High School Associations (NFHS) or of a state high school athletic association. Article 1, Rule 1‐5.1.a. of NFHS's rule entitled "Mandatory equipment" states, in pertinent part, that a participating football player must "wear a properly fitted helmet ... which shall be professionally manufactured and not altered to decrease protection, ...[and] which met the NOCSAE test standard at the time of manufacture." (emphasis supplied). A strict reading of that language would appear to allow a helmet to which a third-party, after-market product has been affixed so long as the alteration does not "decrease protection," and so long as the helmet met the NOCSAE test standard at the time it left the manufacturer. MomsTEAM has repeatedly requested that the NFHS clarify its interpretation of this rule in light of the NOCSAE statements but, as of February 2015, the NFHS has not issued one. I should also note that, when liability and warranty concerns were raised during the filming of The Smartest Team in the summer of 2012, both by the school's attorney and by Schutt, we moved swiftly to address those concerns by having a Shockbox-equipped Schutt helmet drop-tested at Schutt's testing facility. When the testing showed that the insertion of the 3 1/2 ounce sensor in between sections of the interior padding of the Schutt helmet did not in any way effect its performance characteristics, Schutt was able to assure the school that the helmet modification did not void its warranty, and we were able to proceed. Similar arrangements have been put in place to allow even more players on the 2013 Newcastle football team to play with impact sensors this season. Question: What is your bottom line recommendation regarding the use of impact sensors in light of the NOCSAE statement? Answer: In the final analysis, while NOCSAE has every right to protect the integrity of its standards, it should be up to the marketplace to determine winners and losers, with as little government or private interference in that process as possible, so that the best company with the best technology wins. That's called free enterprise. Hopefully, the new NOCSAE ruling will not bring technological innovation to a screeching halt, and will be no more than a speed bump on the road to improved player safety. In the meantime, we believe it should be up to schools, coaches, parents, athletic trainers, team doctors, and the athletes themselves to weigh the benefits and risks of impact sensors, and make the decision that is most likely to improve player safety, NOCSAE certification or no. For an impact sensor buying guide, click here . Brooke de Lench is Executive Director of the 501(c)(3) non-profit MomsTEAM Institute of Youth Sports Safety, the Founder and Publisher of MomsTEAM.com, and producer/director of the PBS documentary, The Smartest Team: Making High School Football Safer, and author of Home Team Advantage: The Critical Role of Mothers in Youth Sports (HarperCollins). Questions or comments? Email Brooke at delench@momsteam.com . You can follow Brooke on Twitter @brookedelench. The last several years have seen a growing number of companies introduce to the consumer market the first generation of impact sensors intended for real time monitoring of impacts to the heads of athletes in actual games and practices. Here are our answers to the most frequently asked questions about sensors.